Edward Merchel III, Winter 2011. 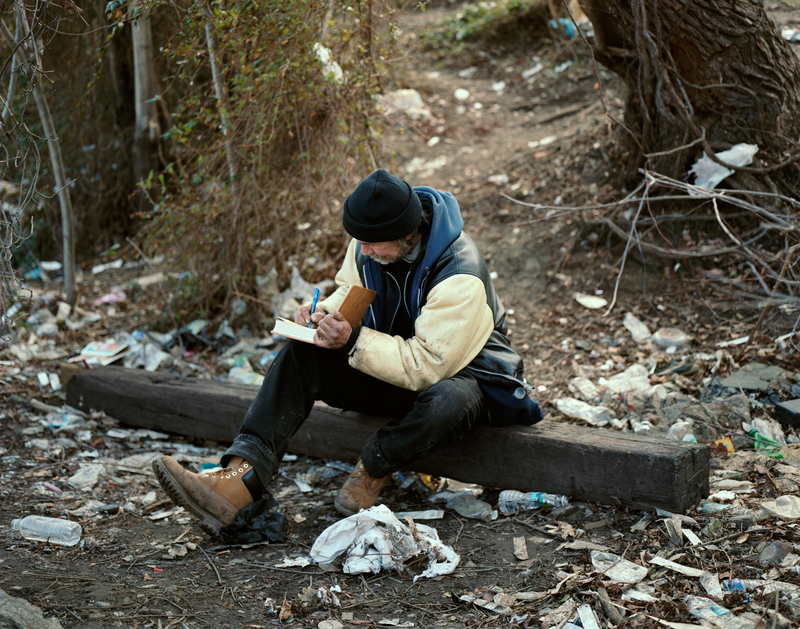 Journal Entry by Edward and Robert Merchel, 2011. 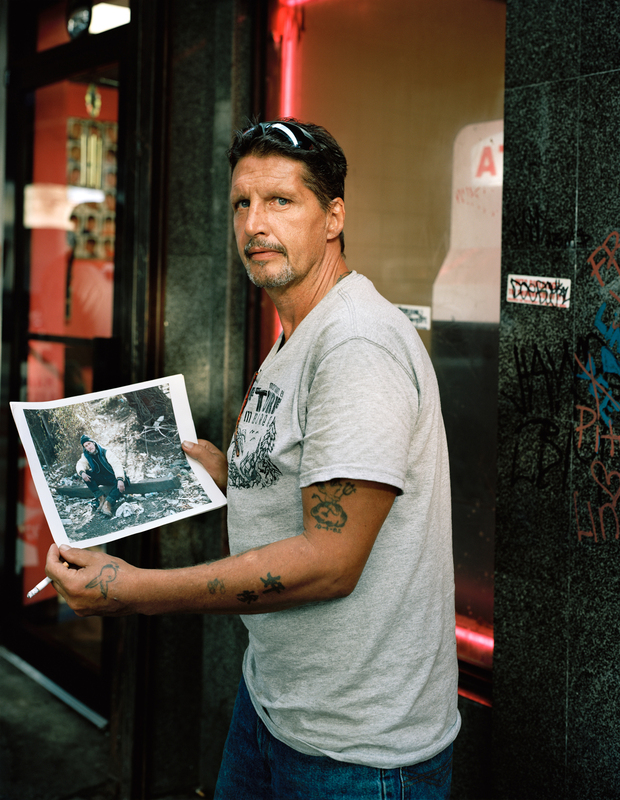 Robert Merchel, holding the photograph of his recently deceased brother, 2011. I met Edward Merchel III while photographing on the abandoned Lehigh Viaduct, also know as “the tracks”. 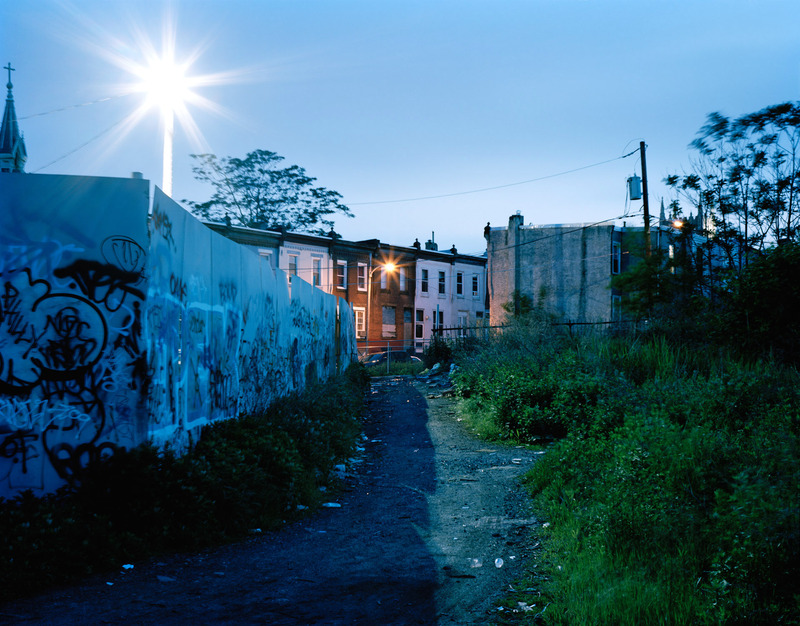 This is a place where addicts retreat from the street in order to shoot up without fear of getting busted. 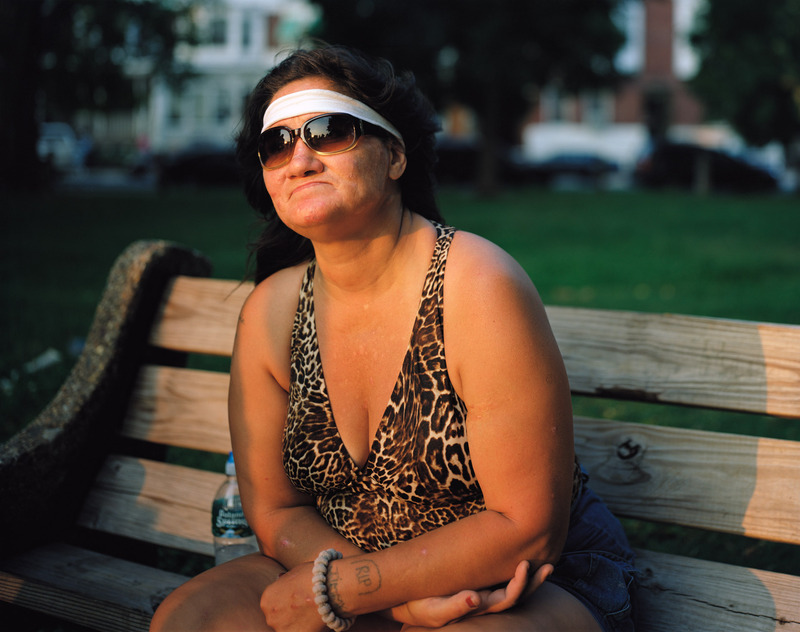 A few weeks later I was on the corner of Kensington and Somerset, sharing new prints with people I potentially wanted to photograph and I met Robert. Robert: He died, uh, July 25th they found him at the gas station on uh, at the Sunoco station. I’m not lying to you. Robert: Uh, my brother Eddie, that’s him…that’s my brother Eddie. JS: Were you close with Eddie? Robert: Yeah, he was my only brother. JS: Were you helping him at all dealing with his addiction? JS: He was on it for a while, right? Robert: Since he was 12. Wow, do you have one where you can see his face real good? JS: I do, the boy took it. Here it is, right here. Robert: Can I have that, that’s my brother. Passerby: I know it is but I really like it. JS: I’ll give you another one. Passerby: E-mail it to me. E-mail it to me. Robert: My brother, my brother’s dead. Passerby: I know he is. JS: I’ll give you another one man. Passerby: Can you email it to me? Passerby: That’s a good picture, ain’t it? Passerby: I was gonna hold onto that. I was just with him a month ago. I was just with him. Passerby: I know he did, let me see the other one. Robert: He was a wall writer. Robert: His name was pretty boy back in the 70’s. Robert: …I was on vacation, and uh, I called home and my father said uh they found my brother we used to call him Stachi. Passerby: Yeah, that was my home boy. Robert: and uh, they found him on uh 25th, it was a Mon…it was a Tuesday and uh, they took fingerprints and uh, my father’s name’s Eddie, Eddie Merchel his name is, right and uh, my dad’s brother’s a cop but he’s retired so when they got the fingerprints he thought it was his brother and he came down and met my father at, ya know, went to his house and he was like, they found Eddie at the Sunoco station on uh, Frankford and Lehigh. I went there last week and knocked on the window and asked the woman about the guy they found dead, she said I was here that day. I said, How long was he there? She said he was there an hour and 15 minutes. Passerby: You’d think you could make a documentary about this neighborhood. Passerby: Seriously..know what I’m saying, this is, this is one of a kind, this neighborhood, really…and throughout the United States there’s probably not a neighborhood like this, seriously. Robert: Sure there is, every city has a neighborhood just like this. Like I been to the Lower East Side of Manhattan. Passerby: I don’t think there is..there’s something, you don’t even..
Robert: No matter where you go, if you meet somebody from wherever and they’ve been to Philly, everybody knows Kensington and Somerset. Passerby: It’s like the Bermuda triangle down here. Passerby: Yeah, man it’s hard. Robert: Once you get in you can’t get out. Robert: This is Hell. This is my brother. Robert: At the gas station on Lehigh, there he is again. He’s dead now, OD’d. What did he sign, pretty boy? That was his wall right writing name back in the day. That’s what we used to do…tag. Robert: (Reading Edward’s journal entry) My name is Edward Merchel, Edward Merchel the 3rd. I was once known as king of the graffiti, in this world from 1975 to 1978. I was, I was the king, which he was, but now its Feburary the 11th, I am on drugs Heroin, Coke and need to get off these drugs. I mean now. Danny: You mind talking to me for a sec? Danny: I gotta talk to you about them pictures. JS: Yeah, yeah, yeah, I’ll talk to you in one sec, man. Robert: Well, that’s enough about me, see all of you later. That’s my brother. Edward Merchel… I’ll write something. 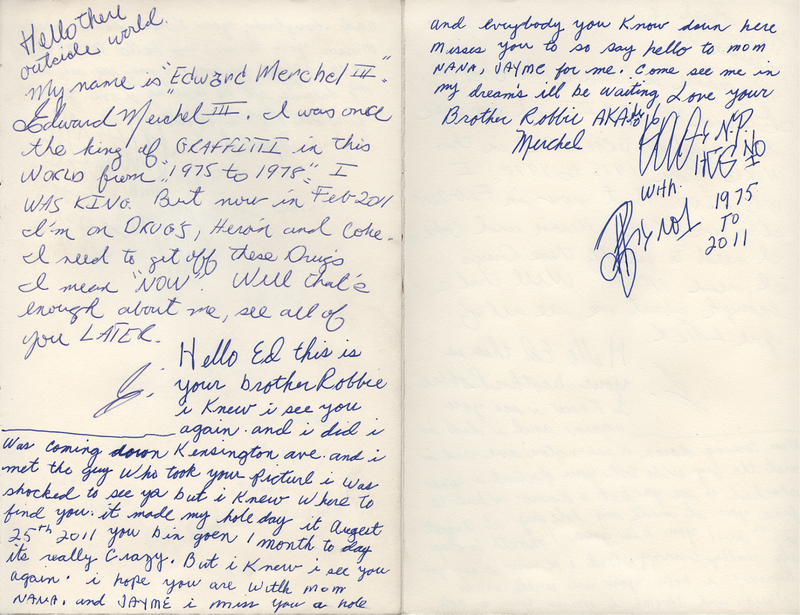 Robert: (Reading his journal entry) Hello Ed this is your brother Robbie, I knew I’d see you again and I did. It was crazy, I was coming down Kensington Ave, I met this guy that took your picture. I was shocked to see you but I knew where to find you. It made my whole day, its August 25th 2011, you’ve been gone one month to the day. It’s really crazy but I knew I’d see you again. I hope your with Mom, Nana and Jamie I miss you a whole…I miss you a whole lot, and everybody you know down here misses you too. Say hello to Mom, Nana and Jamie for me, come see me in my dreams. I’ll be waiting for you, love your brother Robbie. Aka Bolo NP with PB #1. Take it easy Ed.